Well, another holiday season has come and gone. I’ve seen some people use the term “holi-daze” to describe this time of year, and it can be all too easy for stress to trump peace and joy. Thanks in part to conscious decisions to keep things simple, and to my mindfulness practice, I was able to minimize the stress this year, making room to enjoy the meaningful parts of the season. 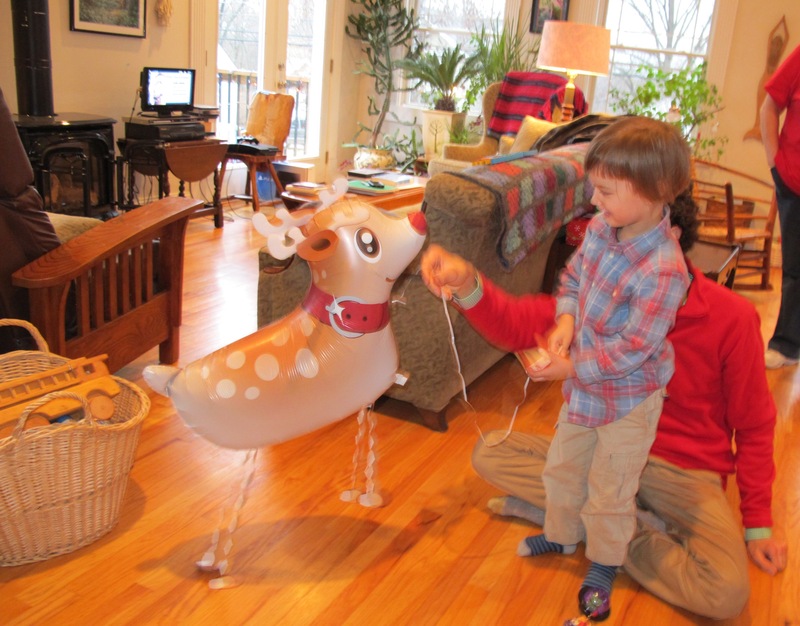 On Christmas Eve, Gabriel fell in love with Rudolph, the Mylar balloon that was accompanying the family Santa on his rounds. Santa let Gabriel adopt Rudolph for a week, after which time the little reindeer was looking a bit droopy around the antlers. Hopefully he’ll be back again next year. After Gabriel was snug in his bed, Matthew and I stuffed stockings and set up the doll house (another advantage of buying used: no assembly required; I just had to arrange the furniture). 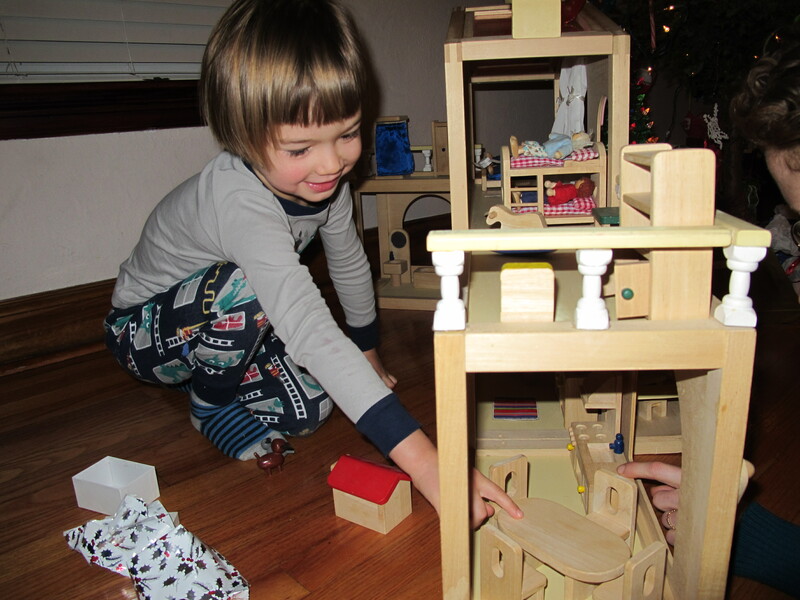 Doll house verdict: Gabriel seems to like it, though I’m having a bit of buyer’s remorse (or is it gifter’s remorse?). My initial excitement has given way to the reality that it’s just a thing, and a rather large thing that now needs space in our apartment, at that. Also, as I’m reminded again and again, all of the things in the world are not nearly as important of having someone to play with. Receiving blanket gift wrap for the win. We spent Christmas day in St. Louis, and then headed to Iowa on the day after (a slight change in our original travel plans that made things a little bit crazy, but it allowed us to spend a few hours with my grandpa before he went back home). 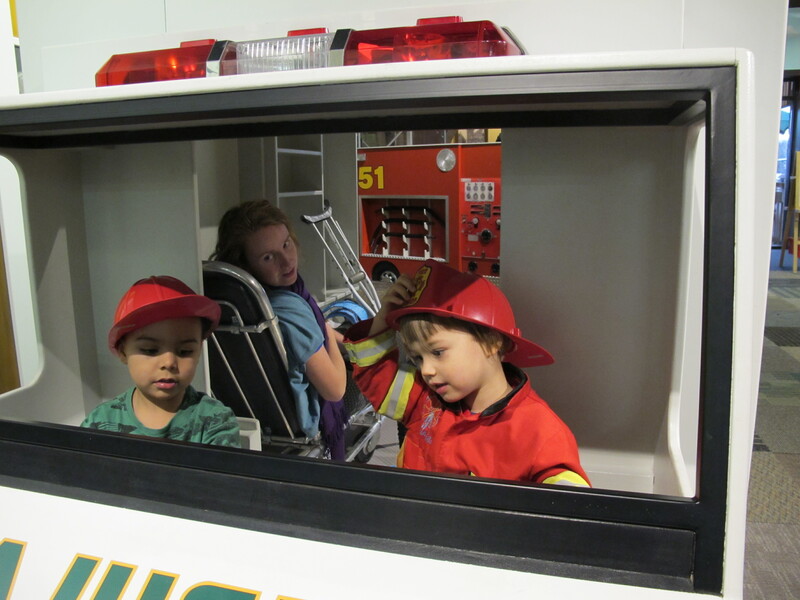 In Iowa, the “lack of playmate” issue was resolved, at least for a few days. Going home (i.e., to my parents’ house) has been a bit stressful ever since Gabriel entered into the equation. This trip was by far the nicest, least stressful visit we’ve had in over three years. While some other variables have changed (e.g., the boys are a bit older), I attribute a lot of this to my improved mental and emotional state. In addition to the family time, we also enjoyed some nice gatherings with friends. As expected, maintaining my mindfulness practice during the holidays, when our regular routine was AWOL, was challenging, but more important than ever. I had to make myself carve out the time and recruit Matthew to Gabriel duty to make it happen. The second week (December 29 – January 4) was the trickiest, but I still managed to meet my formal practice goal (25 minutes/day, five days per week). I’d be lying if I said things were perfect. Two weeks of no preschool was trying, especially since Gabriel is at a stage where the littlest, most ridiculous things lead to meltdowns (e.g., I didn’t use his favorite knife for the peanut butter; I gave him a spoon when there was already a spoon on the table). Even with my mindfulness practice, there is only so much of this I can take in a day before I am on the verge of a meltdown. With three weeks of our aerial silks class left, our experiential gift keeps on giving (fun, exercise, and couples’ bonding time). My in-laws also gifted me with money to use for a mindfulness retreat (I’m looking at a local, weekend-long retreat in March). With it’s impact on so many areas of my life (and on others’ lives, through my relationships), my mindfulness practice is the ultimate gift that keeps on giving! This entry was posted in Health and tagged holidays, mindfulness. Bookmark the permalink. 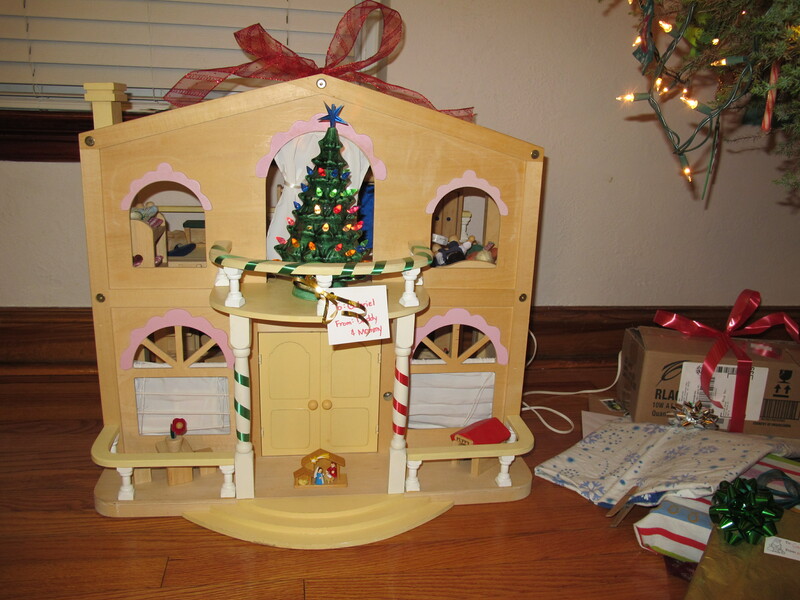 I’m more than a little obsessed with that dollhouse! It’s so cool! You’re welcome to come over and play dolls with G anytime! 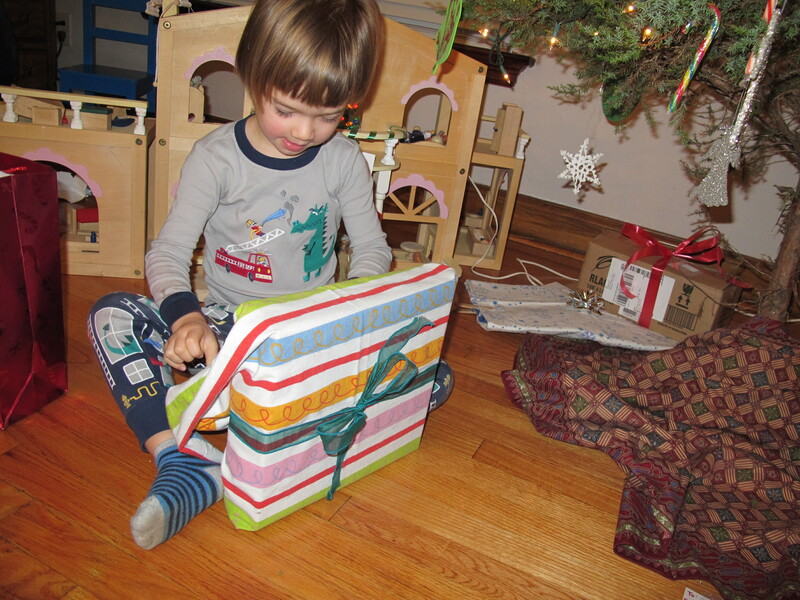 It is pretty cool — part of the idea was that I would enjoy using it with him.